Idles about. Looks around and sniffs. Deals 394 Beast damage. Damage increases by 98 each time it hits. Max 788 Beast damage. Instantly deals 197 Beast damage and causes harmful damage over time effects to deal 137.9 more damage each time they deal damage for 5 rounds. I'm curious if this only affects your opponents current pet, or more accurately, the one marked with the toxic bite. That is, if it works like that that is. Toxic bite is a very interesting ability, if you have multiple pets that have dots that will spam to everyone or current pet up, 1 application of this could deal quite a bit of damage. Great Sting or Pheromones + Swarm of Flies forces the oppondent to think about what dot damage to let his pet take for example. As both options will have the pet take alot of damage. I am in love with this little one. 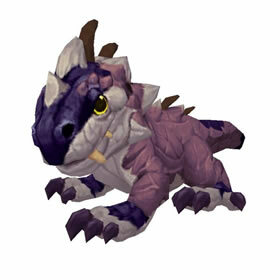 The Saurolisk Hatchling is one of the cutiest pets that was released with BFA. However, it needs to be grouped with a team that can take advantage of Toxic Bite. Typically I am using teams with poisons and abilities to escape damage to shuffle pets in and out. So far I have been succesful with using this pet with Huge Fang, Toxic Bite, and Feign Death. I am still on the fence if it will be apart of future rotations. I am curious to see what Toxic Bite will do. It says it plays off of dots... but not direct hits? They are so cute before they develop razor-sharp teeth and venom.